A vice president since 2014, Frederick (Fred) Thompson is based in the Corning office, where leads efforts to expand LeChase’s business in New York’s Southern Tier Region. In his role, he manages client, employee and subcontractor relationships, oversees daily operations and works to ensure projects meet or exceed client expectations. Fred started his construction career in 1996, and has experience in a variety of market sectors, including industrial, manufacturing, energy, health care and education. 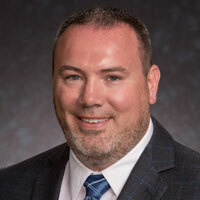 He joined LeChase in 2000, was appointed a project executive in 2005 and became regional operations manager for the Southern Tier office in 2008. Fred has a bachelor’s degree in construction management technology from SUNY Alfred State College, and currently acts as a curriculum advisor for the school. He is a graduate of the Future Construction Leaders program offered by the Associated General Contractors of New York, and is a member of the NYS chapter of the U.S. Green Building Council. He also is a member of the Corning chamber of commerce and the Southern Tier Economic Growth (STEG) organization, and coaches little league and youth soccer in his community.